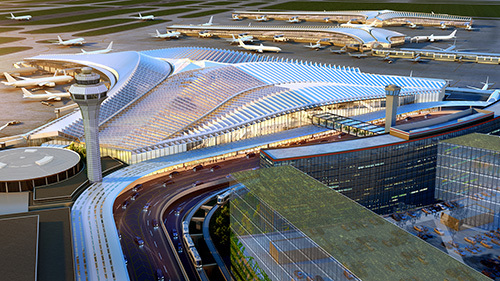 Five teams are in the running to design the new O'Hare Global Terminal. The Chicago Architecture Center has been chosen to host an exhibit of architectural models created by the teams to express their vision. Come see models of all five designs at the CAC from Thursday, January 17 through Monday, February 17. A public feedback period closed Jan. 23 VoteORD21.com. 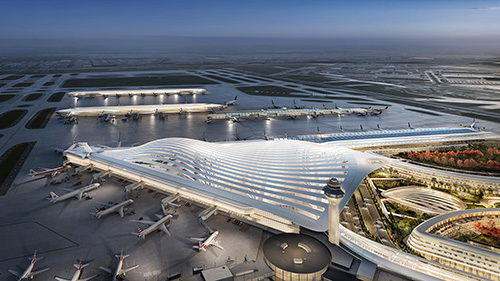 Calling it a "once in a lifetime opportunity" to reimagine O'Hare International Airport (ORD), Chicago Mayor Rahm Emanuel has launched a global search for architects to design the new terminal—the centerpiece of what will be the biggest expansion in the airport's history. More than any other city, Chicago is known for its innovative architecture. 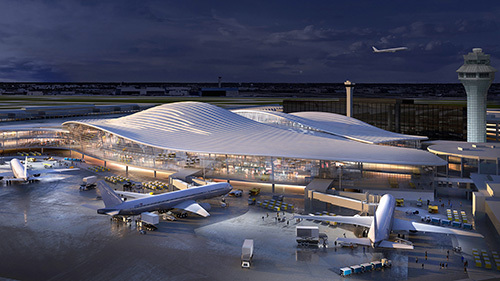 The City is carrying on this tradition with a competition calling upon the world's best designers and using public feedback to deliver one of the most cutting-edge terminals in the nation. *Viewing the O'Hare models is FREE, but regular admission prices apply to view the rest of the Chicago Architecture Center. Each team has provided a short description and image to represent their proposal. 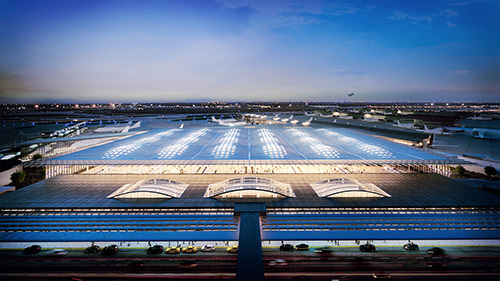 The Fentress-EXP-Brook-Garza Joint Venture's globally-minded terminal design for Chicago provides an elegant, spacious and sustainable gateway to connect Chicagoans and the world with speed and efficiency. Soaring spaces sparkle with sunlight and lift the human spirit. Daylight and spatial composition guide passengers intuitively and purposefully. The latest technological advances shape a smart, seamless, comfortable and unencumbered experience. From arrival to departure, every element of the new terminal is crafted to elevate the passenger, making their journey inspiring, engaging, stirring and fun. 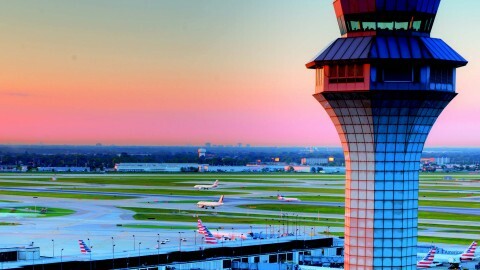 Our vision is to return the romance of air travel to all who pass through Chicago's O'Hare. Our design is based upon a sequence of memorable and distinctive spaces that create a gateway to Chicago with architecture that is open, transparent, inclusive, welcoming and functional, in turn resolving the sophisticated security, airport and airline requirements in a way that meets the needs of both employees and passengers. Three arches frame the landside of the building, merging into a grand single arch on the airside, thus dissolving the barrier between inside and out and allowing the spectacle of the airfield to be visible to all who pass through the gateway, and recapturing the romance associated with air travel. Chicago is a city defined by motion; confluence—of our river, of trail networks, of railroads—has shaped our most vibrant civic spaces. 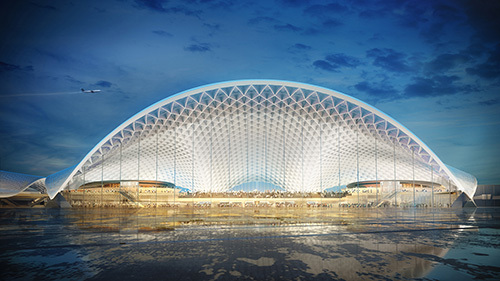 Studio ORD's elegant and efficient design for the O'Hare Global Terminal and Global Concourse unifies the airport's campus by converging seamless lines of motion across three terminals around a spectacular central Oculus. This confluence becomes Orchard Field—a vibrant neighborhood that combines abundant green spaces with distinctive landmarks, bespoke retail pavilions, and diverse activity zones. 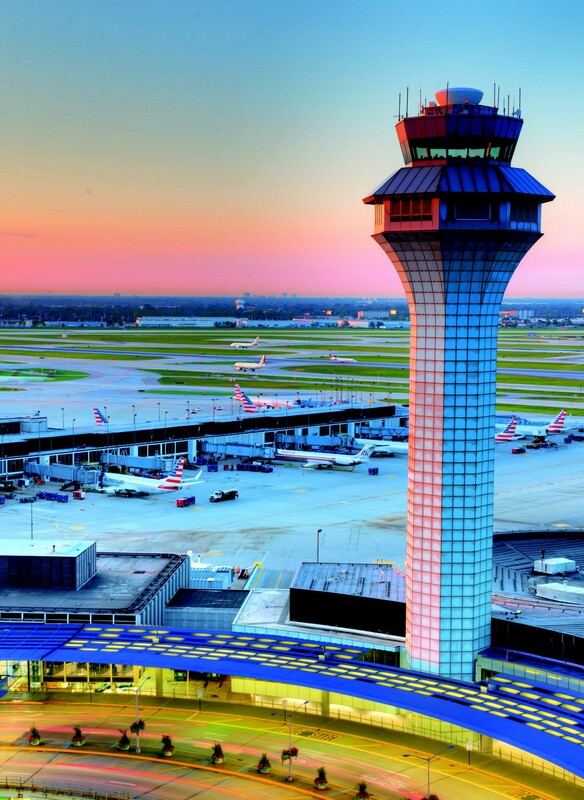 Richly layered and easily navigable, it captures the unique character of Chicago and redefines O'Hare as a 21st century international destination. We have delivered global excellence in this great city, shaping Chicago’s skyline, neighborhoods and public realm for more than 80 years. It’s said that our Chicago buildings turn "pragmatism into poetry." Our elegantly undulating O’Hare Global Terminal aims to be the world’s best, through optimal functional planning, great design and keen practicality—all quintessential Chicago qualities. This can be Chicago’s next great building and our new gateway to the world. O'Hare's Global Terminal by Santiago Calatrava is a masterwork of modern terminal architecture. With a glass façade and dramatic shell-like roof soaring over the approach road, the building unifies the terminal complex while establishing itself as its centerpiece. Convenient links to adjacent terminals, satellite concourses and public transit support a future Vision Plan that transforms the area opposite the Terminal into a vibrant hotel, retail and business complex.